United Grand Lodge of Queensland, AU. The address to the Immediate Past Master and the depiction on his jewel refer to the 47Th proposition of Euclid. It also refers to “our brother Pythagoras”. 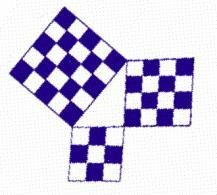 The Master’s jewel is the square, two sides 90 degrees apart which will form the base needed for the 47th problem (in many jurisdictions the square has the dimensions of 3:4, the Pythagorean dimensions). As the Master serves in his position, he becomes more complete, and therefore the 47th problem of Euclid is dedicated on his jewel when he leaves office. When giving this address on the occasion of my installation as Master of Millaa Millaa Lodge I thought back to my studies in electrical engineering and realized the importance that this piece of mathematics had in electrical theory. I then decided to ask some my Masonic peers what they saw as the significance of this to masonry. What role did Pythagoras play? I suppose I was not too surprised to find out that little if anything was known by those I asked. It was because of this that I have decided to put together a paper dealing with this subject and try to put some life into a subject that most people shun, and to also look at the characters mentioned in this discourse, ie Euclid and Pythagoras. We first hear of Pythagoras in the first degree tracing board, and again in the Fellowcraft degree, where we are told in the charge after passing that “the science of geometry, which is established as the basis of our art.” These words tell us of the importance of geometry our ritual writers make within the craft. The first degree tracing board lecture makes many references to geometry and the implements to practice geometry. The use of symbolic geometry occurs in most other Masonic orders over and beyond the craft degrees. The importance placed on learning in our degree work can take us back a great many years to a time when knowledge was neither so great nor as diversified as now. William Preston, the eminent Masonic student, scholar, writer, who lived and wrote in the latter part of the eighteenth century, conceived the idea of making the degrees in general, and the Fellowcraft degree in particular, a liberal education! A 'liberal education' in those days was comprised within what we still call, after Preston, the 'seven liberal arts and sciences.' In those days any mathematics beyond geometry was only for the very, very few. Indeed, mathematics were looked upon as being something not meant for the common men, as being of small use in the world, save for engineers and designers and measurers of land. But Preston, if his lectures are no longer the real 'liberal education' which he planned, and which, in the form of his lectures modified by Webb (and somewhat tinkered with by various authorities and near authorities who at times have kept the husk and let the kernel escape!) built better than he knew. For we, may now, justly and honourably, take 'geometry' to mean not only the science of measurement of surface and area and the calculation of angles and distances, but to mean all measurement. And to study measurement, means to study science, for all science is but measurement, and by that measurement, the deduction of laws and the unravelling of the secrets of nature. This study of the seven liberal arts and sciences is made mention of on numerous occasions in our ritual, what of these? Below is a quote that is 1800 years old. "...let one of these be that art which prepares the body to be subservient, as a prompt and robust vehicle, to the mandates of the soul, and which is denominated gymnastic. Let another art be that which is the angel of the conceptions of the soul, and which is called rhetoric; another, that which is the nurse and tutor of the juvenile mind, and which is denominated poetry; another that which is the leader of the nature of numbers, and which is called arithmetic; and another that which is the teacher of computation, and is called logistic. Let geometry, also, and music follow, who are the associates of philosophy and conscious of her arcana, and to each of which she distributes a portion of her labour." These differ little from those delineated in later times and would still have great implications when applied in today’s modern world. H.P.H. Bromwell (1823 -1903) wrote in his massive tome Restorations of Masonic Geometry and Symbolry that: "Although the number of recognized sciences far exceeds seven, yet, giving to that number the benefit of its symbolic meaning, it stands for the whole circle of sciences, whether specifically named among the seven or not." We usually associate the seven liberal arts to medieval education curriculum, at this time in Masonic circles the only education available may I suggest that an educated member of a lodge was more useful especially if he could apply geometry to his work. The 47Th proposition of the first book of Euclid. The Pythagorean Theorem states that for any right triangle the sum of the squares of its two legs equals the square of its hypotenuse (a2 + b2 = c2). Or we could frame it as the sum of the square of the horizontal and the square of the perpendicular equals the square of the hypotenuse. This is what became known as Euclid’s 47 Proposition. The drawing below illustrates this. We also know this formulation was known before Pythagoras - there is evidence in ancient Egyptian work, ancient China (the Chou Pei manuscript), and the megalith builders. The oldest existing Chinese texts containing formal mathematical theories were produced during the Han period. The Arithmetic Classic of the Gnomon and the Circular Paths of Heaven (Chou Pei Suan Ching) is dated before the 3rd century B.C and contains various modern mathematical principles such as working with fractions using a common denominator, and proofs of many geometrical theories. The text contains an accurate process of division for finding out the square root of numbers. In fact, the Chou Pei presents the oldest known proof of the right-angle triangle theory in the hsuan-thu diagram. This theory, commonly known as the "Pythagorean theorem," shows that the sum of the squares of the legs of a right triangle is equal to the squares of the hypotenuse or (A X 2) + (B X 2) = (C X 2). Regardless, it is attributed to Pythagoras and two hundred years later Euclid compiled his "Elements of Mathematics" where this particular 47Th proposition is found in Book One. This theorem has been called the root of all geometry and the cornerstone of mathematics. The practical applications alone are worthy of the high esteem that Masonry affords it. And this is the interpretation of the lecture that is most considered when masons speak of it but the meaning of this hieroglyphical emblem does not stop there. The emblem we are usually presented is the 3,4,5 right triangle in this fashion: The vertical line is of 3 units, the horizontal is of 4 units, and the hypotenuse is of 5 units. Not only is our attention called to this geometrical figure in the Master Mason degree, it is also prominent in the Scottish Rite in the 20th Degree - Master of the Symbolic Lodge and in the 25th Degree - Knight of the Brazen Serpent. Geometry treats of the powers and properties of magnitudes in general, where length, breath, and thickness, are considered, from a point to a line, from a line to a superficies (surface of a body)and from a superficies to a solid. By this science, the architect is enabled to construct his plans, and execute his designs; the general to arrange his soldiers; the engineer to mark out ground for encampments; the geographer to give us the dimensions of the World, and all things within, to delineate the extent of seas, and specify the divisions of empires, kingdoms and provinces; by it, also, the astronomer is enabled to make his observations, and to fix the duration of times and seasons, years and cycles. In fine, geometry is the foundation of architecture, and the root of mathematics. The proposition is especially important in architecture. Builders have, since ancient times used this theorem in constructing buildings by a process known as “squaring a room.” As the theorem states that 3 squared + 4 squared = 5 squared, a builder starts by marking a spot and drawing a line, say line A. This line is given the value of 3. The builder then marks another point, say point B and draws a line from it at a right angle to line A, and it is given the value of 4. The distance between line A and B is then measured, and if the distance between A and B is 5, then the room is squared. By inverting the process, a “squared” (or rectangle) room can be obtained. Before the advent of GPS and Laser measuring tools engineers who tunnel from both sides through a mountain used the 47th proposition to get the two shafts to meet in the center. The surveyor who wants to know how high a mountain may be, ascertains the answer through the 47th proposition. The astronomer who calculates the distance of the sun, the moon, the planets, and who fixes "the duration of times and seasons, years, and cycles," depends upon the 47th proposition for his results. The navigator traveling the trackless seas uses the 47th proposition in determining his latitude, his longitude, and his true time. Eclipses are predicted, tides are specified as to height and time of occurrence, land is surveyed, roads run, shafts dug, bridges built, with the 47th proposition to show the way. In some lodges, using this principle, a candidate symbolically “squares the Lodge” by being escorted around the Lodge three times during the Entered Apprentice ritual, four times for a Fellowcraft ritual, and five times for a Master Mason ritual, which completed his journey. Earlier in this paper I made reference to the fact that the Egyptians were in possession of the knowledge of the 47th Proposition. According to Plutarch (46 - 120 C.E. ), the Egyptians attributed the sides of the triangle in this fashion. The vertical line was of 3 units and attributed to Osiris. The horizontal line was of 4 units and attributed to Isis. And the hypotenuse was, of course, 5 units and attributed to Horus, the son of Osiris and Isis. It is noteworthy that Plutarch studied in the Academy at Athens and was a priest at Apollo's temple at Delphi for 20 years. In the myth of Osiris and Isis, Osiris is killed which makes Horus the Son of a Widow and links him with Hiram!! The units of the triangle's side are significant. The three units of the Osiris vertical have been attributed to the three Alchemical principles of Salt, Sulphur and Mercury. All things are manifestations of these three principles according to Alchemical doctrine. The four units of the horizontal line of Isis relate to the so-called four elements: earth, air, water, and fire. These are of course the four Ancients. The ascending Horus line with its five units represents the five kingdoms: mineral, plant, animal, human, and the Fifth Kingdom. This is the Path of Return. The ascending line finally connects back up with the Osirian line. The Fifth Kingdom symbolizes the Adept as one who has consciously reunited with the Source of all Being. The 47th problem has been referred to as "the foundation of Freemasonry." Why one of many possible solutions to a particular geometrical problem should become emblematic of Freemasonry probably has more to it the long standing tradition of Sacred Geometry, but the importance of the symbol is largely unknown. Noted cabalist Alan Bennet speculated that the three squares represented the magical squares of Saturn, Jupiter, and Mars. Masonic author Albert Pike, in his Morals and Dogma repeats Plutarch's comments and suggests that the triangle represents matter (Isis), spirit (Osiris), and the union of the two (Horus)...and indeed, the sum of the two smaller squares equals the larger. Pythagoras is credited with the discovery of the Golden Rectangle. The Golden Rectangle is built on the "golden ratio" or "golden proportion," which is determined by the irrational number known as Phi. To put it simply, a golden rectangle is a rectangle divided in such a way as to create a square and a smaller rectangle that retains the same proportions as the original rectangle. To do this, one must create a rectangle based on this ratio. To find the Golden Ratio, one must divide a line so that the ratio of the line to the larger segment is equal to the ratio of the larger segment to the smaller. To get a golden rectangle, you simply turn the larger segment of the line into a square. If you add a square to the long side of the "golden rectangle," you'll get a larger golden rectangle. If you continue to add squares in this way, you'll see the basis for nature's logarithmic spiral patterns. The golden proportion appears in numerous places in nature and in art and architecture. 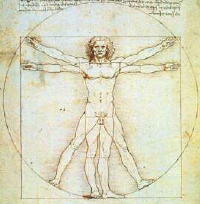 It forms the basis for Leonardo Da Vinci's "Divine Proportion," the ideal illustrated in his drawing Vitruvian Man. The face of the Parthenon in Athens is a perfect golden rectangle. The shell of the nautilus is a famous example of a spiral based on the golden mean, as is the spiral of the human DNA molecule. Vitruvian Man. Although made famous by Renaissance artist Leonardo Da Vinci, the figure known as the Vitruvian Man is actually named for the man who created him, the Roman architect Vitruvius. Vitruvius, a proponent of the Sacred Geometry of Pythagoras, designed temples based on the proportions of the human body, believing them to be perfect. This perfection, wrote Vitruvius, was due to the fact that the extended limbs of a perfectly proportioned human fit into both the circle and the square. According to Pythagorean tradition, the circle represents the spiritual realm; the square, material existence, so the human body represented the perfect marriage of matter and spirit, which was is reflected in its proportions. Leonardo was one of many artists who attempted to depict Vitruvius' perfect man, and the only one who succeeded; his version is considered the most accurate depictions of the human body. From this one can see that man for many centuries has had some kind of relationship with geometry especially the ratio Phi which equals 1.618 most antient buildings have been constructed using this ratio being that which appears most harmonious. Euclid (about 300BC) in his "Elements" calls dividing a line at the 0.6180399 point dividing a line in the extreme and mean ratio. This later gave rise to the name golden mean. There are no extant records of the Greek architects' plans for their most famous temples and buildings (such as the Parthenon). So we do not know if they deliberately used the golden section in their architectural plans. The American mathematician Mark Barr used the Greek letter phi (f) to represent the golden ratio, using the initial letter of the Greek Phidias who used the golden ratio in his sculptures. Luca Pacioli (also written as Paccioli) wrote a book called De Divina Proportione (The Divine Proportion) in 1509. It contains drawings made by Leonardo da Vinci of the 5 Platonic solids. It was probably Leonardo (da Vinci) who first called it the sectio aurea (Latin for the golden section). So, in Plato's Timaios, the elements became a shape in the form of the five bodies, also called Platonic bodies. You first see fire which forms the primary antithesis with earth. Then we see air, without which fire can not exist, and water which forms the liquid part of earth, and without which no life could be possible on earth. Then we see the fifth element, which should according to Plato be in the centre of the elements, and which is called the Quintensens, or to put it more mathematical: the dodecahedron. The solution is that the dodecahedron was not made public. 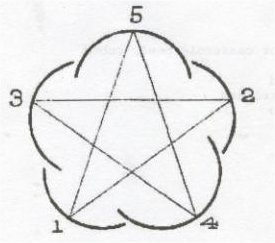 Also in the middle Ages and Renaissance the knowledge of the dodecahedron, and with it the connection of the pentagram was passed on only to the most prominent architect and his closest colleagues. Furthermore they had discovered that the dodecahedron, through connecting certain edges etc. held in itself all other bodies. The dodecahedron became thus the basis for obtaining all other bodies and was not without reason for Plato the symbol of the all all-embracing Universe. How then does this golden ratio apply to geometry and how is it formulated? 0 1 --the series starts like this. The ratio seems to be settling down to a particular value, which we call the golden ratio or the golden number. It has a value of approximately 1·618034.The geometric proportions of the pentagram are those of the golden section, aurio sectio: golden mean. The pentagram was frequently found on potsherds and tablets (which have been dated to as early as 3500 BCE) in the location of the Kingdom of Uruk (at the mouth of the Tigris-Euphrates valley). The symbol was found accompanying signs relating to the foundation of written language. There is also evidence that the pentagram was used in ancient Mesopotamia to indicate the seal of royalty, and power which extends to the four corners of the earth. The ancients regarded the rose as the symbol of secrecy and silence. The confessionals in old churches have the symbolic rose carved upon them; the vaulted ceiling of the council chamber bears it, and the lodge room of medieval masonry is decorated with it. What occurred there was sub rosa, not to be divulged. The pentagram, so easily seen in the rose, was the secret shibboleth of the Pythagoreans; and the Celtic Druids adorned their priestly robes with it. The Christians considered it even a more powerful sign than the cross for banning the evil one; it is found in many windows of the fine old Munsters and cathedrals. Could the five pointed star also represents the five points of fellowship? One of the arguments used by anti-masons to support their claim that Freemasonry is satanic is to refer to the Masonic use of the pentagram. The short answer to this accusation is that the pentagram is not mentioned in any Masonic ritual or lecture and is not contained within the lessons or teachings of Freemasonry. True in essence, this response will not satisfy anti-masons who can point to the many books about Freemasonry that include the pentagram, or at least the five-pointed star, in their iconography, and the writings of such spurious, irregular or psuedomasonic authors as Count Cagliostro, Éliphas Lévi and Aleister Crowley. Although the pentagram, as a geometric figure, is of interest to freemasons since it is also a representation of the Golden Ratio its esoteric significance is only of historical interest. It also isn't satanic. 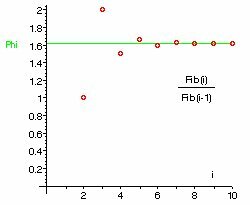 The claims of Lévi and Crowley that there is any esoteric significance to the relative position of the star points is demonstrably not based on any observable astronomical event or on any published precedent. Symbols mean what the users want them to mean—and meanings change. Although Venus is termed the bright morning star or Lucifer; and the pentagram is claimed by Lévi to represent the Baphomet and the celestial motions of Venus sketch a pentagram in the sky; it does not follow that the pentagram represents Lucifer or that Lucifer equates with the Baphomet. Or that any of this has anything to do with Freemasonry. In this short talk I have tried to show the interrelationship that exists between freemasonry and geometry, the relationship of the Golden section, Golden mean, or Golden proportion to geometry and masonry. This is of course by necessity. Due to the complexity of the subject to cover fully would take many hours of discussion. I do hope however that the subject of this talk stimulates the listener to research the subject themselves. Count Cagliostro: Count Cagliostro was a notorist celebrity of the 18th century. Cagliostro claimed to be a healer and an alchemist. One of his most famous dupes was his marriage to a 14-year-old girl, who he claimed was really 50 but due to his powers had been magically rejuvenated. At one stage in his life Cagliostro even claimed to be a freemason from Egypt who had walked on the sands of Galilee with Jesus. Eliphas Levi : is the pseudonym of Alphonse Louis Constant, a French occultist and author whose work greatly influenced many of the early revivalists of the 19th century. Interestingly Aleister Crowley was born the same year Levi died and later claimed to be his reincarnation. His father was determined his son should have a decent education, he sent him to a church in St-Sulpice there to be educated and trained as a priest. While he was there he became intrigued by a lesson received from his headmaster, who during the course of the lesson explained his belief that animal magnetism was a vital energy of the human body controlled by the “Devil”. This sparked his curiosity and surreptitiously he began to study all that he could find out about magic and the occult. His interest had been ignited. Constant continued to pursue his ecclesiastical career and was ordained as a priest. Later he was thrown out of the church and excommunicated due to his left-wing political views and writings, also because he refused to observe his vows of chastity. Euclid: 300 B.C. Greek geometer; founded a school in Alexandria; wrote Stoicheia (Elements), which remained definitive source of geometrical reasoning and methods until 19th cent. Pythagoras: 500 B.C. Greek philosopher & mathematician; generally credited with theory of functional significance of numbers in the objective world and in music.